I love mushroom of any sort....I mean edible ones LOL. I bought some fresh shiitake mushrooms from the supermart and it is locally grown . I normally would have used the dried ones to make this dish but I can't wait to soak them soften for this dish. Thus , I used the fresh ones instead for this braised porkbelly. It is easy to whip up and a dish full of flavors. Hubby's favourite dish. 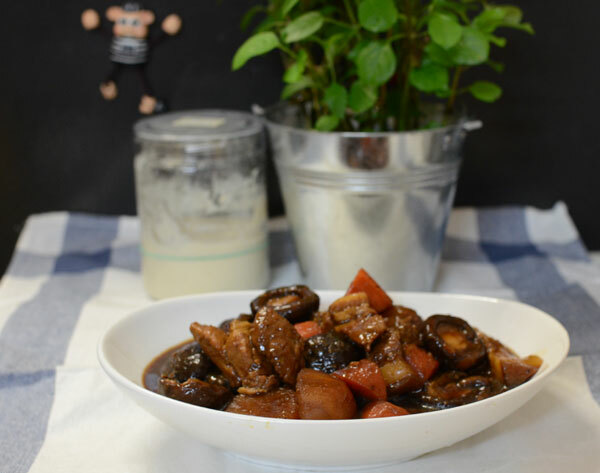 For me I love the mushrooms and the flavorful potatoes which has the tasty gravy absorbed into it. I added some carrots too. 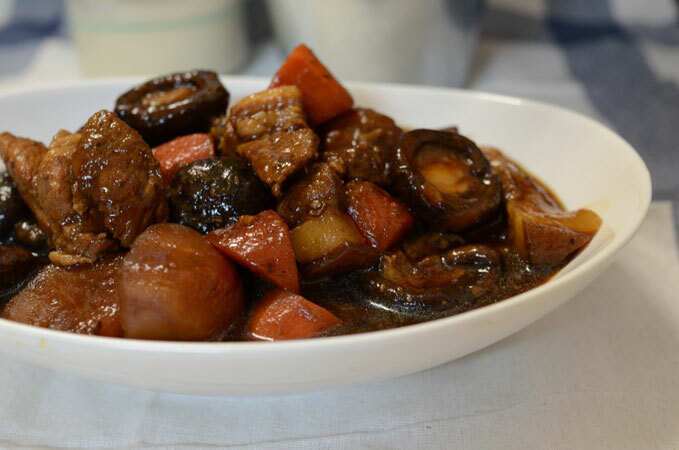 Though the recipe is actually the chinese a pork dish which the Hokkien called " Tau Yu Bak " whereby the porkbelly is used to braise with dark soy sauce, white pepper and garlic till the porkbelly has soften. As usual , I would like to add in mushrooms, potatoes and carrot making this dish no longer the authentic dish but just a dish with lots of other stuff though the method of cooking is still the same. 1.5 hours of slowing cooking brings out the wonderful aroma of this braised porkbelly dish. You can serve this dish with plain porridge or rice or even goes well as a dish for the sourdough bread I used to make. Heat up stainless steel pot under medium low heat , once the pot is hot , add in the crushed garlic and the pieces of pork belly , keep stirring till the meat is half cooked and the liquid has more or less dries off. Add in the thick soy sauce and white pepper and give it a quick stir . Once it is aromatic, add in half of the 1.5 cups water and cover with lid and let the meat simmer till the water has almost dried off. Add in the cut potatoes and carrot and the balance of the water. Cover with lid and continue to simmer till the potatoes and carrots are cooked and the meat are tender. Add in the chicken stock , the fresh mushrooms and continue simmering till the mushrooms are cooked and the gravy has thicken. Add salt to taste. Dish up and serve with rice, porridge or eaten with sourdough bread.